Istrian souvenirs, let's be honest, are as much Istrian as they are Chinese. Just like anywhere else in the world very few products intended to tourists are actually made in the country. Frank got so screwed once over Istrian truffle that tasted like a shoe sole that it still hurts to think about it. Frank will not name the brand, but it was from the biggest Istrian producer. Disgusting! To help you avoid crappy, cheesy, made in China souvenirs, Frank decided to give you a list of products actually worth buying and bringing back home as genuine Istrian souvenirs. If you haven't try Istrian olive oil, it's like you simply haven't try olive oil at all. Italy, Spain and Greece account for 75% of world production of olive oil. This is the reason why we all know about Spanish, Italian and Greek olive oil. Croatia itself accounts for tiny 0.2% of the world production. But like in many cases, the quantity doesn't always mean quality. Istrian olive oil is maybe not known worldwide, but trust Frank when he says that it is the one of the best olive oils he has ever tasted. And he means majority of them. Either you buy one of the famous Istrian olive oil brands, or you simply go to a local producer, everywhere you will find olive oil of exceptional quality. Istrian specialties are single sort extra virgin olive oils. These means that only one type of olives are picked, pressed and bottled. The genuine sorts are: busa, zizolera, bjelica; while popular “naturalized” sorts are: ascolana, picholine, pendolino and leccino. The best known Istrian olive oils producers are are Oleum Viride, Ipsa, Chiavalon, Meloto. They have well established brands, but it also comes with a price. The price of their olive oil amounts to 60 € a litter. If you have money to spend, it is an excellent gift. If you are not ready to spend that much, but you would still like to bring back home some of Istrian liquid gold, go for Agrolaguna souvenir pack. You get three 0,25 l bottles of different kind of single-sort olive oil packed in a gift box. The price is 20€. The best place to buy it is at their little store just outside of Porec green market. This is one of the top ten Istrian souvenirs to bring home. Buy olive oil directly from the producers or from designated stores. Don't by any chance buy olive oil from the green markets, road stands, souvenir stands and cheep souvenir stores. They tend to buy cheep Italian olive oil and bottle it attractively to sell it to tourists. Istria in the last twenty years changed its wine reputation million times for the better. Many young wine producers took over family vineyards and manage to produce excellent wines. Three wines really typical for Istria are: red wine Teran, white wine Malvasia Istriana and dessert wine Muscat. Teran, a red grape variety typical for Istria, is rich, slightly sour, full-bodied wine. It is not for everybody. Istrian Malvasia, on the other hand, is fresh and fruity white wine. It is a kind of wine that fits everybody or almost. Muscat is sweet dessert wine. Some of the producers Frank would recommend are: Pilato, Kozlovic, Kabola, Agrolaguna Festigia, Damjanic, Coronica and Trapan. Avoid buying wine ate souvenir shops and grocery stores because you will end up over paying it and missing on the whole new experience. Instead arrange a wine tasting tour directly with a producer. Visit his cellar, taste the wine, learn about it and buy right there. Excellent experience! Another great souvenir from top ten Istrian souvenirs to bring home! Truffles are really popular in Istria, especially in the area of Motovun. The best known producer is Zigante. The guy holds Guinness record for the biggest white truffle ever found. But beware: many souvenir shops sell truffles but they are not truffles from the Istria. This is definitely the trickiest of all souvenirs listed here. I would suggest either to go to Motovun and look for a real truffle hunter to buy directly from him (in October when it is a truffle season, it is very common to meet many of them with truffles in the hand), or just avoid buying. The risk is too high. It makes it into top ten Istrian souvenirs only if it really comes from Motovun forests. Central Istria abounds with forests and meadows. It is inhospitable for cattle breeding, but it is ideal for smaller sheep and goats. Istria has a long tradition of cheese production. Sheep were for long time the only source of milk and meat for the local people. Rural Inn Goli Vrh out of Materada , near Groznjan, is run by Branko Maglica and his wife Yvonne. Mr. Maglica farms sheep and produces excellent organic cheese which he serves and sells. Get yourself a good map of Istria, and head for Goli Vrh for sheep cheese of an excellent quality. This is great and genuine Istrian product and souvenir to bring home. Another producer, Agrolaguna, although more industrial, it still offers excellent quality sheep cheese, cow cheese, mixed cow and sheep cheese as well as cheese with truffles. You can shop for cheese in their little store just outside of Porec green market. Or even better visit their farm close to village Tar and buy cheese there. This is original souvenir to bring home and another one of the top ten Istrian souvenirs. In south Istria, close to Pula, you will find Stancija Kumparicka. This family run farm produces excellent goat cheeses. They have a semi-hard goat cheese made from unpasteurized (raw) milk and aged for minimum of 30 months, semi-hard cheeses aged 3-30 months, then fresh cheese from unpasteurized milk (in the form of rolls, small cheese cakes and the like), feta cheese and curd. And while in Istria, taste Istrian curd. It is maybe not something you can bring home. It is not sealed. It is a soft, fresh cheese that doesn't keep long time. But you can consume it while in Istria. It has a high nutritional value which is the result of a great amount of proteins. Bukaleta is traditional Istrian pottery jug. It is probably one of the most popular Istrian souvenirs. It is a jug shaped like a bird. Each one is unique, hand-made and painted. Traditionally Istrian soup is served in bukaleta. Istrian soup is a drink made of red wine Teran, sugar, grilled bread, pinch of black pepper, and olive oil. This soup is made and served in Bukaleta, and it is especially popular in winter time. Everybody drinks from the same jug. Kazun, a typical Istrian stone shelter house, has been miniaturized and sold as a souvenir. It has a round shape, it is made of stones. Its appearance in the green and red Istrian fields is so remarkable. People use it as shelter for people. The name comes out from Italian: ‘casa'; and kazun means ‘little house'. Look for this typical Istrian field house miniature that are made in Croatia. kazun is one of the most common Istrian souvenirs. After the grapes are pressed during the wine-making process, pomace left over is used to make Istrian brandy. Istrian brandy is very similar to Italian grappa. It is made exclusively from grapes (not from other fruits). It is strong in alcohol (35%-60%). It has many flavors depending on herbs and other ingredients added to pure brandy. The most renowned Istrian brandy are Biska, grape brandy with mistletoe leaves and fruits; Ruda, a grape brandy with rue leaves; and Medica, grape brandy with honey. Buy Istrian brandy either from wine producers directly or from designated stores. This makes it one of the original Istrian souvenirs to bring home. Don't by any chance buy brandies on the markets, road stands and cheep souvenir shops. They tend to buy cheep brandy in continental Croatia, pack it attractively and sell it as genuine Istrian brandy. Macerat are phytotherapeutic oils. Plants are extracted using maceration process, and the extract is added to extra virgin olive oil. In Porec, at the big parking, there is a small market where you can find Vrt Express stand offering wide choice of these phytotherapeutic oils. the most popular are St. John Wort Oil, Immortelle Oil, Sage, Rosemary, Lavender, etc. They come in 10 ml, 30 ml and 40 ml bottles. The price vary accordingly: from 4,5€ for the smallest bottle, 8 € for 30 ml bottle, and 9 € for 40 ml bottle. This is one of Frank's favorite Istrian souvenirs and a great gift for all your family and friends back home. Why not take home some home grown, freshly picked and dried herbs. Great quality and home grown herbs you can find at Porec market. Vrt-Express, a local producers of Mediterranean plants and herbs, has their little stand at Porec green market. Buy a bag of dried oregano, chive, lemon balm, lavender, etc… It is produced in Istria, it is cute and it is not expensive. Frank himself being a great cook, finds herbs one of the best Istrian souvenirs to choose from. Porec mosaics, Beram fresco paintings, Novigrad bell tower, hand painted roof tiles, musical instruments such as bellows and long Istrian flute, are all nice Istrian souvenirs to bring back home from Istria. Am wondering if there are any teputable brands of truffle oil for sale and if so where could I possibly find them. Will only be going ss far as Pula on the Istrian Peninsula, as well as far off cities like Split, Zagreb, Dubrovnik, Opatija..
try Karlic Tartufi near Buzet. You run a very nice website. Reading your hints, I found one little but important fault: you forgot one ingredient in the Istarska Supa: a pinch of pepper. I know this traditional nutritions. Hi Günter, thanks so much for reading, and for reminding of a missing ingredient. I added it now. Thanks! Hey Frank. I would appreciate your help, please. I found this intriguing jug at an estate sale in Florida. I had to have it. Is it a Bukaleta? Was it make in Croatia or is it a cheap Chinese made souvenir? Any information or links you may be able to provide me is greatly appreciated by me. Hi Frank – following you on instagram as am holidaying on Croatia at the moment! Just on the off chance – I am trying to track down a supplier of Immortelle oil for a colleague back in New Zealand – and see you have mentioned it in your blog….do you have any idea where I may be able to find a supplier please?? 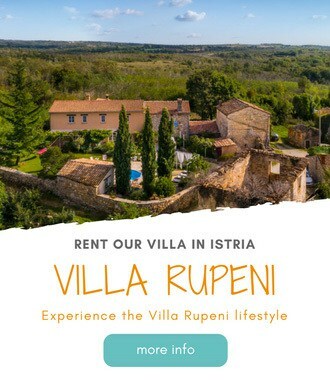 Heading to Istria next week…. Possible long shot I know! Hi Donna, thanks for reaching out. People selling Immortelle oil have now a shop in Zbandaj, a small village 6 km away from Porec, on the road to Pazin. It’s an open flower shop right on the main road, and tgey also sell those oils . You can check their website http://www.Vrt-Express.Com for detailed directions and the contact. Thanks for this guide as well!